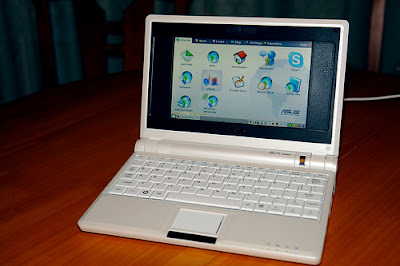 Ok I have succumbed to the lure of the most talked about ultramobile PC on the planet - the Asus eee. Yep, I just bought myself one of them cute li'l critters in pearly white. First, you need to be fairly conversant with handling different interfaces as the GUI which is LINUX based is quite different from Windows. Some of the familiar short cut buttons and yellow balloon like prompters have disappeared. The use of the ultrasensitive track pad also requires getting used to, as are the smallish keyboard buttons (which thankfully has good tactile feel). I am still pretty much a mouse person so I may get one of those tiny ones to supplement my surfing habits here. I've got myself a slightly souped-up version with 2GB RAM so surfing the net was a jiffy. Switching between different applications was also generally a breeze once you get used to it. However, you do need to surf some of the forums on asus eee to really learn the best way to manage this affordable play thing. While the screen size is pretty lilliputian at 7", it was bright and clear enough for me to see without having to take off my glasses. Yes, I have reached that uncomfortable age of going into the bifocal zone.... The useful Fn hot buttons on the device also helps one in navigating, although I wished that they had dedicated buttons instead. One thing which you need to be mindful though is that this baby is HOT! By that I mean that you should try to get a cool, hard and flat surface to rest the thing instead of your lap, as it can literally cook you alive. No kidding. In terms of specs, the processor speed is definitely good enough for a tiny device like this. Most activities take place speedily without any hesitance at the tap of the buttons. It may be good though if a touch screen version could be created as that would help speed up navigation significantly, although the minuses of such a feature is the greater power consumption which it entails. Battery life wise, the device seems pretty fuel efficient, and is touted to last as long as 3.5 or even 4 hours, depending on its usage. One thing which I love is the super quick boot up time thanks in no small part to the Flash Solid State Disk and far nimbler Linux OS. Overall, for the price that I paid, I will say that I am pleased with it (so far).... I will be putting this midget to the test over the next few days and will let you know if it is going to be taking over my Nokia E61i as a constant mobile companion.